In the organic whole, the Eucharist occupies a unique place as the “Sacrament of Sacraments”: all other sacraments are ordered to it as to their end. The Eucharist is “the source and summit of the Christian life”. The other sacraments, and indeed all ecclesiastical ministries and works of the apostolate, are bound up with the Eucharist and are oriented toward it. 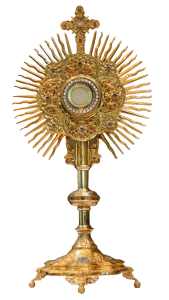 For in the blessed Eucharist is contained the whole spiritual good of the Church, namely Christ Himself. The reception of First Eucharist follows adequate Catechetical instruction, usually in the second grade level. Children first receive the Sacrament of Reconciliation, generally during the Penitential Season of Lent. Every Catholic is encouraged to receive communion weekly at Sunday Mass and they are urged to make a frequent good confession, especially if in a state of Mortal Sin. It is fitting that First Eucharist be received during the Easter Season. Due to the large number of children receiving, each child will be assigned a particular date by the Office of Religious Education. Your cooperation is appreciated.